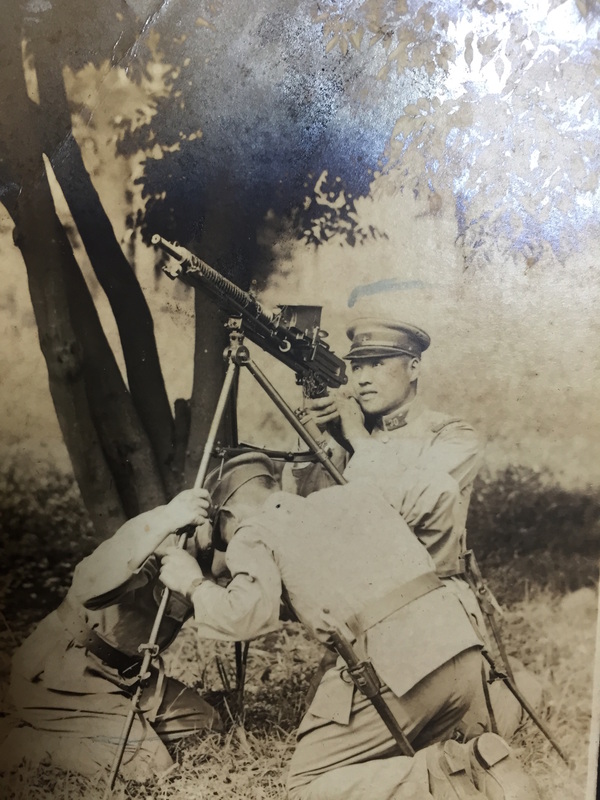 Reader Blake sent me a couple very interesting photos recently, and they show a pretty unusual item – a Nambu Type 11 tripod. 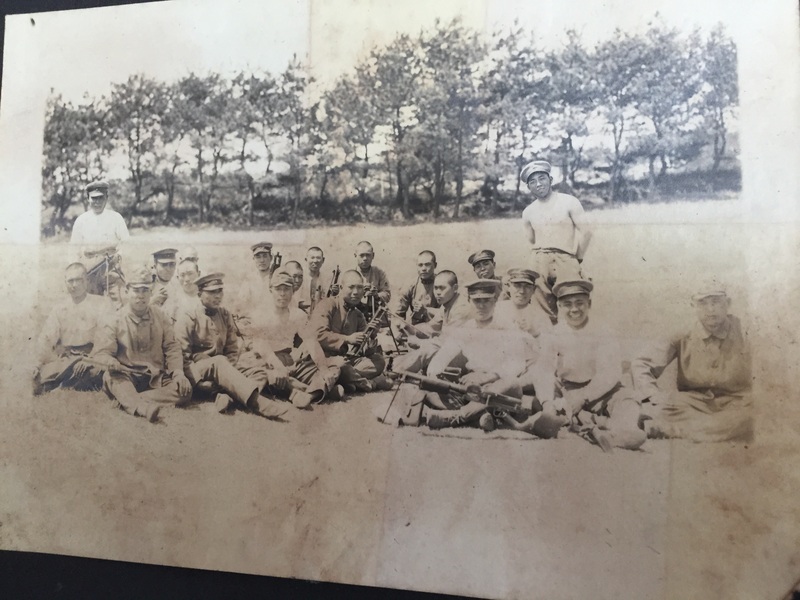 Blake is an American living with his Japanese wife in Japan, and these photos are of her grandfather, Katsuji Aritsue, who served in the Imperial Japanese Army in China, where he was wounded. It would appear that he was a squad machine gunner with a Type 11. 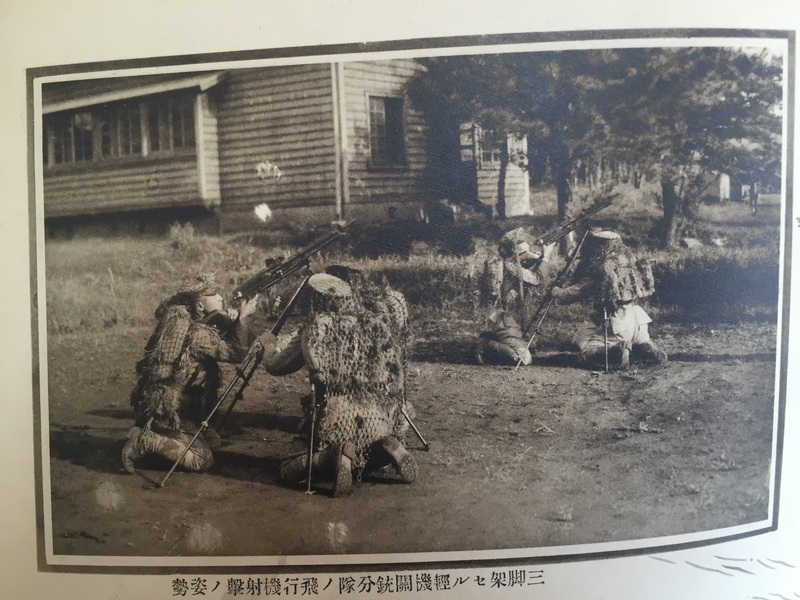 The first photo shows the man (Blake didn’t mention his name) in full formal kit with his Type 11, on its tripod. Those tripods are very scarce items to find, with some people speculating that they may have only been experimental. This would suggest otherwise, as this photo was taken in the Chinese theater. Note that while not an officer, he does appear to be wearing a sidearm in a clamshell holster. Next up is a photo apparently from basic training, with the tripod being used in its anti-aircraft configuration. This was a common feature on early tripods, but again, it is very unusual to see a Type 11 tripod at all, much less set op for AA use. Lastly, a picture from maintenance instruction during basic training. Thanks to such an ‘exotic’ source we get a unique insight from what was “the other side”. This is most appreciated. One thing I notice is a ‘subtle'(or even spindly) appearance of those bipods and tripods. In contrary, the tripods used on MG34 and MG42 were beefy and highly versatile. I guess, it is world apart, literally. Notice that the other crew members support the tripod with their hands. It was probably not solid enough for AA gunnery without such additional support. While certain amount of dispersion is not detrimental to AA shooting, there are of course limits for that after which the bullets will just go all over the place and any kind of aiming becomes impossible. More specifically, one should be able to see a general direction where the tracers go in order to adjust fire (good luck for hitting anything without tracers). If the general direction covers half the sky, making a meaningful correction becomes pretty much impossible. On the subject of aiming, does anyone know how that AA sight is supposed to work? I see only a single tiny ring, when a normal ring AA sight should of course have a ring and a bead. Perhaps the bead is obscured somehow in the image? Darn, I can’t see a ring at all. The resolution of the photographs isn’t that great, but it still shows that even the most blood-thirsty army is composed of (mostly) ordinary people taken away from the comforts of home. The spindly tripods for the Type 11 machine guns might have been made that way considering how much the average Japanese soldier could carry while on the move in a place with no convenient gas-station. If anybody remembers, the Japanese were waging war on a budget (which became even more strained after Pearl Harbor) and still required pack horses and even ox carts for transportation. Just how much can you carry while marching through a big country (China) where as far as you are concerned, everyone is simply out to kill you and take everything from your cold dead hands? Weight consideration is a good point. They certainly relied on bicycles a lot too so they might have been fairly weight conscious. The multi use approach they had with ammo and grenades would suggest logistics was quite a consideration in the choice of what designs were adopted. Interesting that the current edition of Small Arms Review has an article by Robert G. Segel on the Type 11 and it has three photos of the tripod showing it folded and for ground and air engagement. Certainly is a clamshell in photo 1. I have one here on the desk next to me to compare with. Now that is cool. This reminds me of a story I was told(Caveat:I can’t remember all of the details), a friend of mine who was in the navy told me about an experience he had in Kamakura. Basically he was in line for a bus, but it turned out to be for the wrong bus, and Japanese man(who could speak english) pointed him to the right bus, but not before inviting my friend to dinner with his family. When at the man’s home, he met the man’s father who was a WWII veteran and was asked what he thought about Japanese soldiers. My friend not wanting cause problems told him that he thought that they were very brave. Apparently this was well received, as my friend was treated quite well by the man and his family. 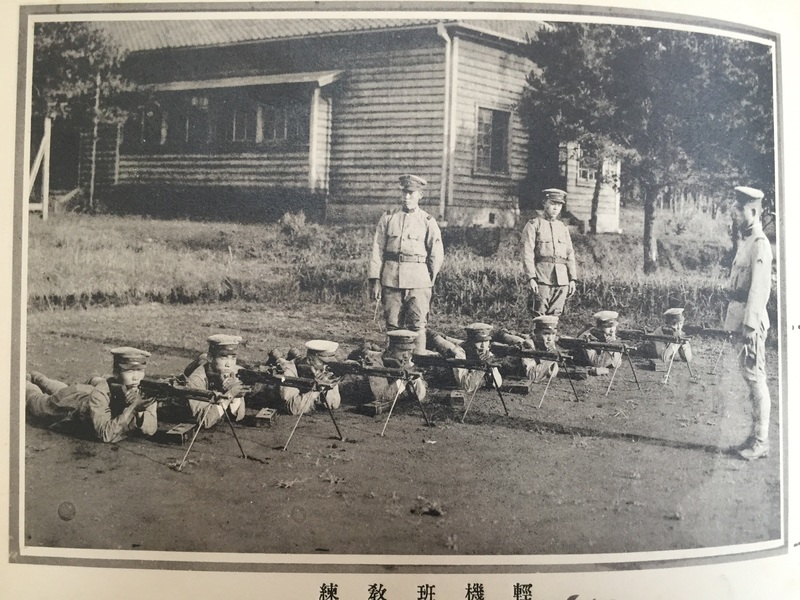 The Nambu gunners lined up on the range seems like they are about to suffer permanent hearing loss. Is that really how they would practice? Probably not. It looks like a posed shot made to look impressive by having many guns in the same picture. They didn’t seem to bother about hearing protection back then. They seem to have really liked the idea of multi use gear. Apparently the hopper feed system could take rifle chargers. Doesn’t sound like it worked so well but was a good idea to try since ammo was ready to use in anything. It reminds me of the versatile knee mortar bomb/grenade system. The grenade discharger used either the standard grenade or a purpose designed bomb, interchangeably, as I recall. It was a decent weapon when used as intended. I don’t have any references handy, but I’m pretty sure there were a couple of different models. I think the way range was adjusted on the grenade discharger was really clever. The firing pin was moved in or out to increase or reduce chamber volume. Interesting, but mechanically unreliable. 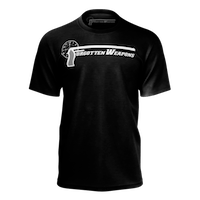 The wheels really came off when it was learned through experience that full power rifle ammunition exacerbated the reliability issues. A special reduced charge round was then adopted for the Type 11, that totally negated the rationale for the hopper feed. According to Ian’s article on this very site (https://www.forgottenweapons.com/light-machine-guns/type-11-nambu-lmg/), the reduced charge cartridge was designed to reduce muzzle flash rather than fix any reliability issues. He doesn’t give any sources, but I would be surprised if they weren’t sound. I know I’ve seen other sources that cite reliability/wear issues. Given that the Type 99 has a flash hider (and some of the Type 11’s contemporaries had them as well), muzzle flash seems like a REALLY dubious reason to complicate ones logistics, ESPECIALLY when they could have switched to ALL low flash cartridges, for rifle AND machine guns. Well, you could still fire the reduced charge cartridges with a rifle and the full power ones with the LMG, so it didn’t necessarily complicate logistics that much. According to Roy Dunlap in his book Ordnance Went Up Front, any unit with Type 11’s would be issued only reduced-charge 6.5mm. 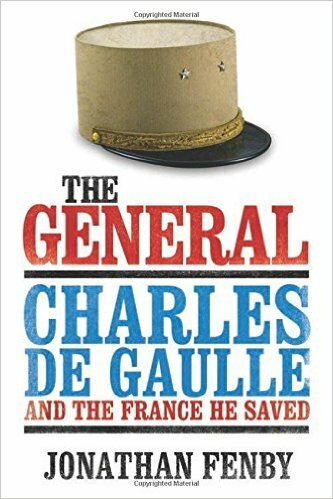 For what it’s worth, given the multitude of unfortunate technical errors in his book (for which I don’t really blame him – working from own experience in the war and limited reference material). This is Blake, the guy that sent the old photos. Sorry about the resolution had to take a pic of a pic. (no p.c.) Anyway I looked at the first photo today ( the one taken in China ) It seems that my wife ‘s grandfather ‘s rank is that of a superior private. I would like to know what you all think about what year this photo was taken in? The photo is out of his personal photo album . The album has many candid photos from his basic to China service to convalescing in the hospital after being wounded and of working in a wartime factory after discharge up till the end of the war. I think that the period the album covers is from 1935 to 1942 or 1943 till 1945. I really wish he was here so I could ask him tons of questions. I know I could get some info from the Obu city ward office, but it won’t give me the juicy details that really make up a persons life. By the way did you guys check out the after the range time photo ? The type 11 on the ground right side has what appears to be a heavy leather pad under the barrel and gas tube. From the photos that are uploaded here I can tell you a few things. Some you probably already know. 1. It’s very obvious he is a light machine gunner, that is also the reason why he is issued a pistol. The handgun he is issued judging from the holster seems to be a Type 26 revolver. These revolvers were issued to machine gunners as their backup weapon. 2. The uniform he is wearing is called the Type Showa 5, designated in the year of Showa 5. He is wearing a enlisted version. And as you have said he is a superior private. That means he either got through a test during his boot camp, or that he reenlisted during the beginnings of the China front hostilities. 3. The uniform would suggest this is probably after the Marco polo bridge incident and before the type 98 uniforms were designed. This would date the pictures as taken between 1931 to 1938. 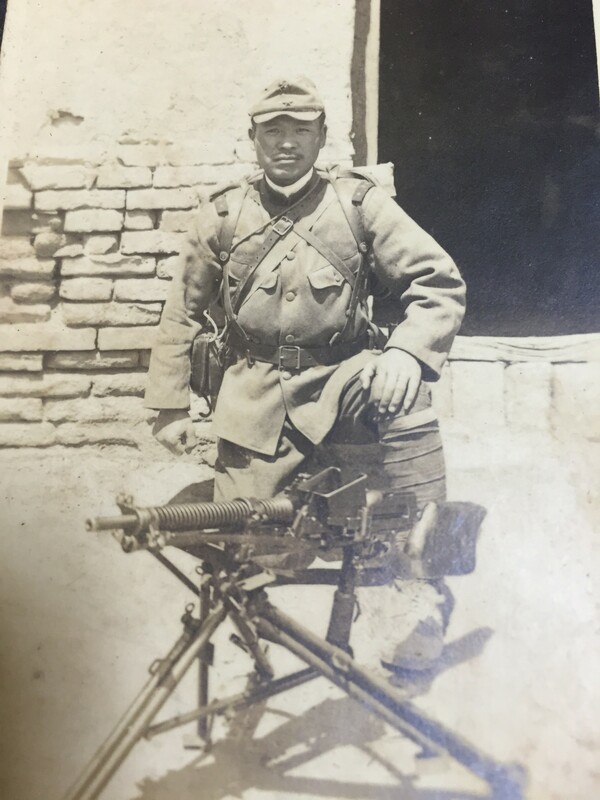 The first picture looks like him in a front line field gear, which strongly suggest this was taken in China, as there were no other frontlines. Unfortunately I could not tell you where exactly. 4. 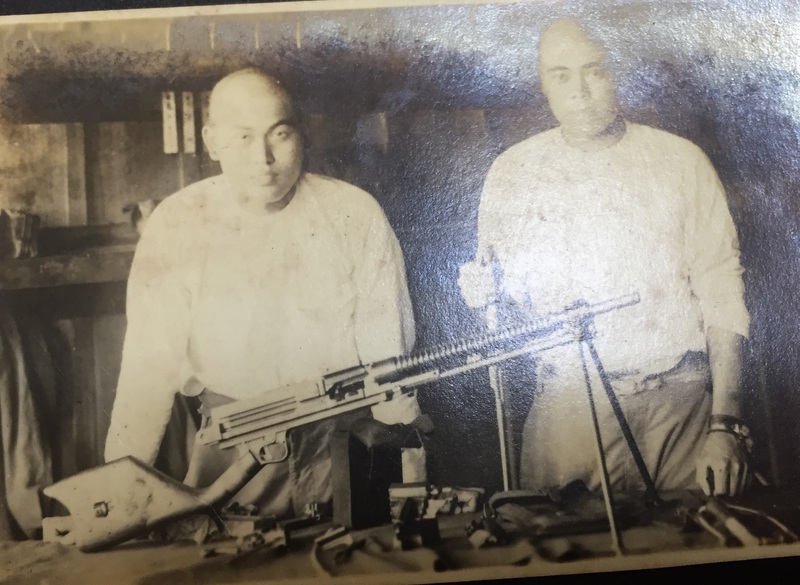 From his training pictures, it would seem he belonged to a Machine gun squad (Japanese doctrine before 1940 was to have separate Machine gun squads), and to the 30th infantry regiment. That would also make sense from his frontline pictures as well, as the 30th infantry regiment was called out to the frontlines for the Marco Polo Bridge incident and also the battle of Khalkin Gol. I would love to see more pictures. Thank you very much for sharing them. Thank you very much for the info. Is there a way I can get in contact with you? I’d like to learn as much info as I possibly can. I would like to have something to pass down to his great grand children (my nephews). Blake, thank you for sharing your wife’s grandfather’s pictures. He looks like a tough guy! And he must have been a bit of a techie for his day, to have taken so many pictures. I’ve been reading intensively about the Japanese military lately and am aware that most of the best material is only published in Japanese, in Japan. Unfortunately I am too old to tackle such a different new language. For Anglophone readers looking for some Japanese memoirs, I can strongly commend the oral histories collected by Dan King. It will help Americans especially to understand how Japanese could be at once “normal people” just like any of us, and at the same time in the sway of culture and propaganda that would produce seemingly illogical and even insane acts of foolhardy courage. Why did Japanese fight to the death? Because they thought defeat meant death anyway, or slavery. Even the people feeding them that propaganda tended to believe it. It is a good thing that the old gentleman survived the war, isn’t it? Thanks for the comment. I think he looks tough too. My wife says he was really curious and kind. The photos from the album are really good, so I guess he was a bit of a techie. I also have a funny story from my family about the U.S. perception of Japanese fanaticism . My great uncle Don was on a artillery crew in the marines on Okinawa . He brought home some souvenirs from there. (another interesting story in itself ) Anyway he gave my grandmother a small brown medical vial with kanji on it. He told her that he thought it was a poison vial. ( you know how suicidal the japanese are) My grandmother swore it was a cyanide vial. I was told this story as a child and wondered what it said on the vial. When my wife and I went back to the U.S. for our first visit with my family we went to my grandmothers house and I had my wife read to me what was written on the side of the bottle. My wife made a gesture of holding the bottle above her eye . I called my grandmother in the room to tell her that the cyanide bottle was nothing more than a bottle of eye drops. The look on her face said it all. Well so much for fanaticism .